The recent run of frosts means the writing is on the wall for a number of UK veggies. Lettuces, celery, broccoli, and fresh herbs are always the first to struggle with the cold. We’ll be looking to France and Spain to keep those products on the shelves during the winter. While on the one hand this highlights our reliance on European trade, the upside is that we get to do business with some of our esteemed European farms again. The French co-operative growers Univert in Provence is one of several from whom we buy direct. They specialise in leafy things including spinach and the first pallet of the season arrived today, bursting with greenery and promising plenty more goodness to come. Agrico-op in Sicily is another fave. You will know them for their excellent citrus. 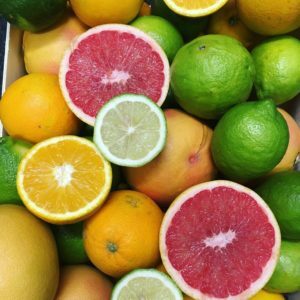 Oranges, lemons and grapefruit are just kicking off, so flavours are still developing and skins are yet to come to full colour. This is particularly evident in the lemons as they are bright green. Lemons need a significant temperature difference between day and night to ‘shock’ them in turning yellow. Mild days and nights mean they ripen but stay green. In UK news: The beauty of seasonality is that just when some things finish, new things tend to pop up…Purple Sprouting Broccoli is starting this week from Francis Sampson in Penzance, Cornwall as well as Duncan Gielty in Ormskirk. Remember you can eat the whole thing: floret, leaf and stalk! A final note: The fuel strikes in France are set to continue this week, so we’re still on alert with regards to possible disruptions.